so, as i've said before, i really try not to make this blog about me. it is, after all, the PERHAPA-blog and so i try to keep it about the book, weird and creepy things, and comics, movies, that kinda stuff. sure, my perspective comes through with what i write--it's impossible to be THAT objective. plus, i think that would be a pretty boring read. like a robot wrote it. someone asked me what i was doing for my birthday and i said, "ignoring it." unfortunately, there were other people NOT ignoring it. i got birthday calls and emails (mostly 'cause myspace thinks it's a good idea to let all your 'friends' know it's your birthday...%#$@in' myspace! ), nice presents from my brother, sister-in-law, niece, and nephew, my dad, and my partners 'n pals, mike and craig! highest on that list, though, was my girlfriend, sharon. those who know me will find it hard to believe that anything could leave me speechless, but this did it. oh, and after i took some pictures--it was delicious! and the red icing around the edges started to melt a little in the warmth of the house and looked just like blood oozing out from the sides--choopie woulda loved it! thank you, sharon--it was wonderful! a wonderful cake and a wonderful birthday! 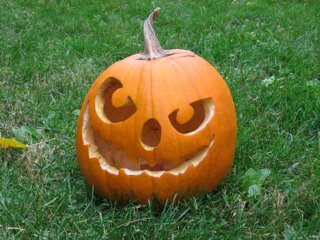 so while we're in personal mode--and after i wrote about the dark green/black pumpkin i had last year--sharon and my nephew, tyler, and i went out last saturday and picked up a few pumpkins of our own. orange this time, of course. 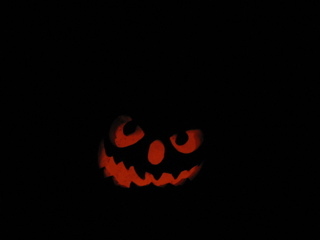 we dug them out, though tyler had to go home before we all got our faces carved. he and i kept talking about what cool things we could put in them rather than candles. he's 10--this is what we think of. 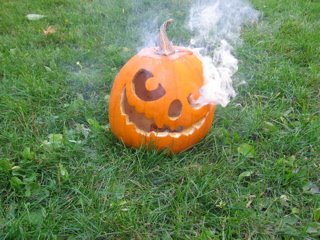 he called me later to say that, while he still thinks that we should blow them up (with the m-80's i have left over from fourth of july), it would be cool to throw a couple smoke bombs in there and see the smoke pouring from the eyes and mouth. 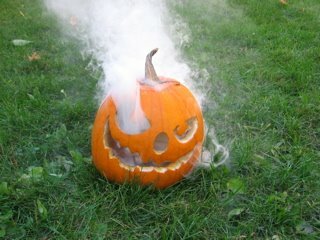 so here's my pumpkin for this year. the last few shots are for tyler. i'll be back here on wednesday with, hopefully, another scary story. 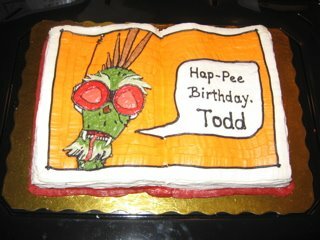 Extremely cool cake Todd, I'd say that Ms. Sharon is a keeper. 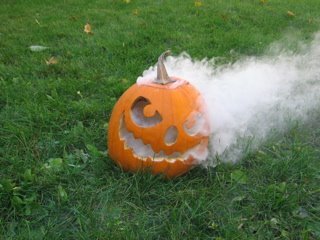 As for the pumpkins, loved the ones with the smoke billowing out of them, so thanks for sharing the pictures and I'll be looking forward to seeing Mr. P after his meeting with the M-80's. i sent you an email with the transcription of the 911 call attached, but it sounds to m,e like you're looking for maybe an mp3 clip of the actual call? i've never heard the actual call. i got the transcription out of a book of stupid 911 calls and copied it out myself for the blog. wish i could be more help. if you do find it, i'd love to hear it too--as would, maybe, some of these fine blog-buddies a' mine--so maybe you could let us know where you find it...? thanks again and sorry i can't help you more. The cake looks great. Please tell Sharon she did a great job. I'm going to suggest a new marketing idea for conventions. Choopie cupcakes, with blood red frosting.